How should you prepare for a meeting with a military recruiter? Learn about what to expect and what questions to ask. If you are unsure of which service to join, you may want to visit recruiters from all of the services. Tell the recruiter up front that you are visiting all of the recruiters before you make any decision. It's a good idea to bring a parent, relative, or better yet, someone who has served in the military for your first visit. However, make sure it's someone you're comfortable with hearing the answers to the personal questions your recruiter will ask during that first interview. These include, "Have you ever used drugs?" The recruiter asks these questions to make sure he knows your basic qualifications and whether or not he can afford to spend valuable time with you. If you don't want your parents to hear the truthful answer to these questions, you're probably better off going alone. It's a good idea to prepare a list of questions to ask, in advance. Be as specific as possible. While most recruiters will not lie to you, remember that the recruiter lives or dies by the number of people he/she can recruit. He or she may not volunteer information which may chase away a potential quota-maker. It's up to you to ask pointed, specific, no-nonsense questions, and expect direct answers. Be very suspicious of any unclear, or vague answers. Always press for specifics. If in doubt, ask the recruiter to put the information in writing, and sign it, or to show you in the regulations, guides, or pamphlets that what he/she is saying is true. If you're joining the active duty Air Force or the active duty Navy, in most cases, you don't want to ask too many questions about specific military jobs. Job selections for these branches are performed during your processing at the Military Entrance Processing Station (MEPS), and the recruiters have nothing (or little) to do with it. Rather, focus your questions on the general advantages of that particular service (length of basic training, leave (vacation), medical care, barracks/dormitory/housing conditions, education benefits, etc.as). If you're joining the active duty Army, active duty Marine Corps, Army or Air National Guard, or the Reserve forces (of any of the branches), the recruiter will have more input about job opportunities (more on this in the next chapter). Treat the recruiter with the same courtesy that you would give if you were at a meeting with the hiring director for a civilian job. Recruiters are busy animals. Recruiters put more hours on-the-job than just about any person in the military. Recruiters do not get a monetary bonus for signing people up. They get their regular paycheck, whether you enlist or not. If you drop by without an appointment, don't be surprised if your recruiter isn't there. He might be taking someone to MEPS, speaking at a high school, trying to calm jittery parents at an applicant's house, or taking a few days of well-deserved leave (vacation). Show up for your appointment, and don't cancel at the last minute. If you were trying to get a job with Microsoft, you most certainly would not walk in dressed like a bum or make an appointment, just to cancel it at the last minute. Sooner or later, you're going to have to stop shopping, and decide on which military service you want to join. You may have met a recruiter who impressed you, or you may have met a recruiter that left you cold. It's important that you not choose your military service based upon your perception of the recruiter's quality. Choose your service based on your interests, not whether or not the recruiter was kind enough to buy you lunch at McDonald's. Once you make your decision, make an appointment with the recruiter for the service you want to join. The first thing the recruiter is going to do is to pre-qualify you. The recruiter will ask you a bunch of questions to see if you qualify for military service. These will be questions about age, citizenship or immigration status, education level, criminal history, drug abuse history, and medical conditions. The recruiter may weigh you, and ask to see personal paperwork (birth certificate, high school diploma, social security card, etc.). It's important that you be truthful with the recruiter. It's also very important that you not allow the recruiter to encourage, advise, or even hint that you lie about any of this important information. It is a felony to give false information or withhold required information on any military recruiting paperwork. Remember, there is no right to join the United States Military. 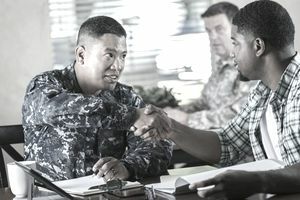 The recruiter uses the information you give to determine whether or not you are qualified to join, based on Department of Defense (DOD) and individual service standards. Those standards exist for reasons. It is not up to you, or the recruiter to decide which standards are valid and which ones are not. It is much better to be disqualified for enlistment in the first place and never join; then it is to lie about it, go through basic training, have the lie discovered, then get thrown out of the military (possibly with an administrative discharge that will follow you for the rest of your life). In addition to the pre-qualification questions, the recruiter may ask you to take a sample Armed Forces Vocational Aptitude Battery (ASVAB) test. It is a computerized ASVAB "mini-test," with representative questions in the four areas of the ASVAB which determine the overall ASVAB Score (AFQT Score). These areas are Word Knowledge, Paragraph Comprehension, Mathematics Knowledge, and Arithmetic Reasoning. This "mini-test" has a pretty good reputation for estimating what you're AFQT score is going to be when you take the full-blown test. Some recruiting commands have policies that will preclude scheduling the applicant for the actual ASVAB unless they achieve a designated minimum score on this "practice" ASVAB. Of particular importance is the medical questionnaire (there are two of them—the first one is completed in the recruiter's office, and the second one is completed at MEPS when you take your physical). It costs the military a lot of time and money to process the medical physical. If medical pre-screen in the recruiter's office finds anything questionable, the recruiter must get permission from the medical officials at MEPS to even schedule you for a physical. Just as there is no right to join the military, neither do you have the right to have a physical. If the MEPS medical official determines (from the pre-screening questionnaire) that you are not medically qualified, they can simply refuse to allow you to take the physical. If this happens, you're pretty much dead in the water, as far as enlistment is concerned, as waivers are generally not granted in such cases, nor is there any workable avenue of appeal. What if You Don't Meet the Standards? Even if you don't meet the standards, sometimes criminal history, minor drug abuse, and medical conditions can be waived. Whether or not a condition can be waived is not up to the recruiter. It's up to superiors in his/her command (exactly how high up the chain of command depends on what the waiver is for), who make decisions based upon current law, regulations, and policy. Some things can't be waived, and the recruiter can tell you this, straight up front. Is the condition subject to aggravation by military service? Will the condition preclude satisfactory completion of prescribed training and subsequent military duty? Will the condition constitute an undue hazard to the exam or to others, particularly under combat conditions? How are current recruiting goals? How bad does that particular branch of the service need this particular applicant at this particular point-in-time? Generally, when the services are doing well in their recruiting efforts, fewer waivers are considered. During years when the services are having a tough time finding enough qualified applicants to meet their quotas, they are more generous in the waiver approval arena. I have seen waivers approved for a specific condition, only to see a waiver disapproved for the same condition, by the same service, just a few weeks later. Remember, each of the services has their own standards and policies when it comes to processing recruiting waivers. If you don't qualify for one service, it's possible that another service would agree to process and approve a waiver. In general, the Air Force has the reputation for approving the fewest waivers, followed by the Marine Corps, the Navy/Coast Guard, and finally the Army. Because National Guard recruiting policies can differ greatly from state-to-state, many times, the National Guard will approve a waiver that the active duty and reserve forces won't even consider. Once the "pre-qualification" is done, the recruiter then knows whether or not he/she can start processing you for enlistment. How Old Can You Be to Enlist in the Military?